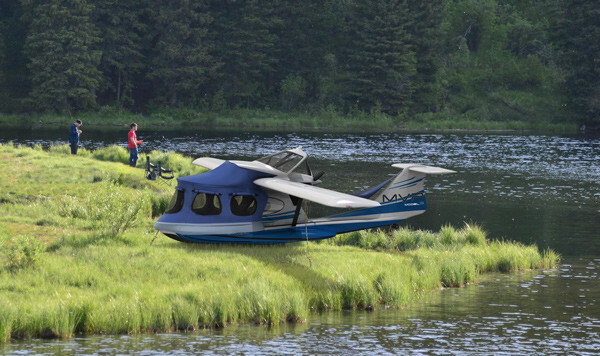 The Minnesota-based aircraft company MVP Aero announced it plans to build and test at Brunswick Landing a prototype of an amphibious aircraft it designed using composite materials. PORTLAND, Maine — The designer of an amphibious, folding-wing plane designed to access hard-to-reach fishing holes or marinas and boathouses announced it will build a prototype of the craft at the former Navy air base at Brunswick Landing. The Midcoast Regional Redevelopment Authority said Friday that MVP Aero announced its decision at the U.S. Sport Aviation Expo in Sebring, Florida. The company will be a tenant at TechPlace, a business incubator at the former Navy base, according to MRRA spokesman Ben Sturtevant. MVP Aero said it has solved engineering problems to bring down the weight of the airplane by using composite materials. It has put scale models in the air and tested its hull designs in water tanks and is now focused on putting together a full-scale prototype. Paul Richards, MVP’s director of business development, said the company picked the former Navy base because of its advanced airport facilities near the Androscoggin River and Casco Bay for testing the flying boat; local expertise both in composites and boatbuilding; and the ability to build the full prototype in the TechPlace building. Richards said the company is about three to four years away from manufacturing the plane for sale. With that, the company’s still not decided where it would manufacture sale models, but Richards said Brunswick Landing could work. “We’re not in the position to make absolute commitments by any means, but there are a lot of good reasons why the area makes an awful lot of sense,” Richards said. The company, founded in 2011, is based in Minnesota, according to its website. Development of the plane has been supported primarily through private financing and its founders hold an 85 percent stake in the company. The market for the craft is primarily affluent adventure-seekers, Richards said, a market that has its own range of possibilities, from docking on a megayacht to storage in a garage. Richards said the target price for the plane is around $219,000. To make that more accessible, he said, the company may market shared ownership models in which multiple pilot-captains could take the helm. Richards said the company estimates development of the prototype would take between 18 months to two years.